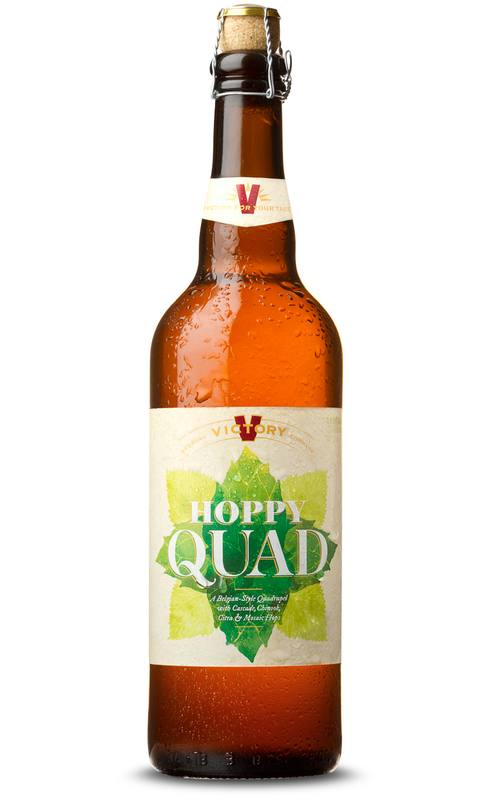 Downingtown, PA, October 5, 2015– Inspired by the Trappist brewers of Belgium, Victory Brewing Company (Victory) announces Hoppy Quad, its first endeavor in the quadrupel ale style since the ever popular V Twelve, with its own whole flower-hopped twist. Intense yet approachable, the Belgian-style ale exemplifies the union of traditional fermentation and brewing techniques with modern ingenuity the brewery has become extremely well known for. A bright and bold beer, Hoppy Quad is brewed exclusively with American hops: Cascade, Chinook, Citra, Mosaic and is fermented in the Belgian yeast strain. As a result, the smooth and elegant brew boasts exceptional aromas of freshly cut peaches against hints of brewer's grain while aromatic notes of citrus and resinous cedar are evidenced. Capitalizing the B in bold, freshly intense Hoppy Quad is flavorfully more assertive compared to dubbel and tripel counterparts and with an ABV of 13%, this surprisingly easy drinking brew takes center stage as the life of every party it attends. On shelves and on draft through November, Victory’s Hoppy Quad is available across the brewery’s 36 state distribution footprint, in 750ml bottles with a suggested retail price of approximately $9.99. Pricing will vary slightly based upon location. Use Victory’s Beerfinder to discover a nearby location, or download the free Victory Mobile app for Android or iPhone. Victory Brewing Company is a craft brewery headquartered in Downingtown, Pennsylvania. Founded by childhood friends, Bill Covaleski and Ron Barchet, Victory officially opened its doors in February of 1996. In addition to the original Downingtown brewery and brewpub, Victory recently opened a second state-of-the-art brewery in Parkesburg, PA to expand production capabilities and serve fans of fully flavored beers in 36 states with innovative beers melding European ingredients and technology with American creativity. To learn more about Victory Brewing Company visit us on the web at www.victorybeer.com.